Never a company to shy away from upsetting their passengers, Ryanair has upped fees and plan to lower service levels to less than you’d expect on a city bus. In Communist Russia. And CEO Michael O’Leary is quite proud of this. Over at Europe a la Carte, Karen Bryan lets us know that Ryanair has decided to up their payment card fees to an exorbitant £4.75 per flight. This means that booking a return flight for two will cost a full £19 in credit card fees alone. Now, you can still get around this by using a Visa Electron Card for the moment, but that won’t work for travelers from most countries outside of the UK. As I’ve covered before, Ryanair doesn’t want anyone to travel with luggage, and are fining air passengers who try to get around the rules. With their hefty fees on bringing luggage on a flight, at £9.50 per bag and flight, it’s already prohibitively expensive to bring luggage. That, and if you bring a bag currently, you need to check in at the airport, at a fee of £4.75 per passenger and flight. Meaning your bag costs at least £28 for a return flight. And for that you can only bring 15kg (33 lbs) for all checked bags combined. The carryon bag allowance is also quite skimpy at 10kg per person and you are only allowed one bag. Infants can’t bring baggage at all, so I’m not sure how families manage without incurring overage fees. All these things point to one thing, if you’re bringing luggage, Ryanair wants to milk you for all you’re worth. And, if you’re looking at checking some luggage, by the end of 2009, that’s going to be even more difficult. Ryanair is planning to remove all check in desks from all airports they’re operating from by the end of 2009. The savings may come back to travelers by reducing the air fares, and possibly even by lowering the checked luggage fees, which will be possible to do online. But don’t count on it, as Ryanair warns fees may rise until then. Check in desks and staff will be replaced by a simple bag drop, I suppose along the lines of what British Airlines is already operating on most routes. There’s also the question about travelers who hold passports outside of the EU zone, as currently they can’t check in online with Ryanair. My wife for example can’t, as she travels on a US passport. It will be quite interesting to see what Ryanair is planning to do around this, as I’m sure they don’t want to lose custom from overseas travelers. This past week, Ryanair also began rolling out inflight cell phone use for travelers. Meaning we can now look forward to our seat neighbor blathering on about how much fun his vacation will be to his friends while we’re trying to read. Ugh. The Telegraph, again, has a piece on this. While Ryanair isn’t the first airline with inflight cell phone use, that ‘honour’ goes to Emirates, it’s the first budget airline to do it. The airline is planning to roll out the ‘service’ to the entire fleet within 18 months, and currently have it installed on 20 planes. One of the good things is that only O2 cell phone users will be able to place calls right now, and only 6 calls can be made at the same time, meaning that for a while we can avoid having the whole cabin gabbing away. All in, this means that for me, Ryanair will be the airline of last resort. While the headlining cheap air fares may be tempting, the awful service, steep fees, and general disdain of their customers is putting me off. There are after all many other budget airlines operating in Europe, and it’s about time to explore them. 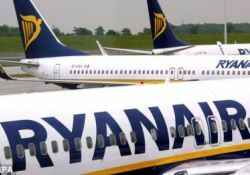 What are you thinking about Ryanair and budget airlines? Share in the comments below. Last updated by jack on 23 February, 2009 in Travel News. One just has to love Ryanair, cowboy pilots, retarded cabin crew & ground staff, hidden charges, extortionate on- board prices, cattle class as even George Orwell couldn't possibly foresee. I've stopped booking Ryanair myself. Not worth the hassle and very poor service, and that's not even considering the Ryanair fee lottery. I am disgusted with just having booked a flight with Ryanair. The website is deliberately designed to con people out of money and after navigating my way through that mine field i got lumbered with the payment handling fee, £5 per person per journey an extra £20 for both of us. Ryanair - i can promise you that this is two less passengers that will fly with you. I dont mind paying for things but i dont like being robbed by underhand tactics - if you are going to charge something be BOLD about it. This truly is the most sleazy gutless company i have come across in a long time. I hope you are proud! At least, Ryanair won't introduce the tax for fat people - read more Ryanair will not introduce fat tax. It si just too much. In my opinion, O´Leary didn´t choose the best strategy he could. Well, looks like they're doing it again... Ryanair might start charging for the 'privilege' of using the onboard toilets: See more here! Easyjet. That's what I think.